Looking back, the reason why stills film photographers largely ignored neutral densities was that we were regularly getting shutter speeds that stretched into the minute duration's without the use of any special filters. This was due to 'reciprocity failure'. Reciprocity is the rule that all photographic lighting control is based around, i.e. that if you decrease the light by one ‘stop’ the duration that the sensor (or film) needs to be exposed to light is doubled. So, if I have a shutter speed of 1 second and add a 1-stop neutral density filter, then the resultant exposure would have to be 2 seconds. All films had a range of light that they could record, but started to struggle once that range dipped below a certain exposure value (too little light). This was where ‘reciprocity failure’ came in. Every film had a table that you either had to memorize or carry around with you. As soon as the exposure hit 1 second or longer, you would have to calculate the increased duration of time to expose the film based on the particular film stock’s reciprocity failure table. Fuji Velvia 50 film, a favourite of many landscape photographers, required a an exposure compensation from 4 seconds onwards. Moreover, if you wanted accurate colour a colour compensating filter would have to be added to the front of the lens. Considering that the photographer was starting with a film that was set at 50 ISO (usually set to 40 ISO in camera as many photographers believed this was the the better ISO rating for the film), even just the addition of a polarizer with its light loss of two stops would lead to scrambling for a table or calculator to work out the resultant exposure time. So it was relatively easy to get exposures of a minute without even resorting to the use of a neutral density filter (during twilight etc). Neutral density filters were more important for cinematography and videography. Here, film makers had to try and get their shutter speeds to an effective 1/50th of a second (for 25 frames per second film). As soon as you start to work with a relatively wide aperture for isolation and depth of field effects, the shutter speed would need to be lengthened so as to keep below the required 1/50th of a second for smooth film movement. For the vast majority of film work, a 3-stop ND would be more than sufficient (as evidenced by the popular 1, 2 and 3-stop ND filters for the Phantom and Mavic drones). Digital sensors are different in that there is no reciprocity failure. They are linear in the way that they record light. Reducing the amount of light hitting the sensor by 1-stop will always double the exposure time, and lengthening the exposure duration does not suddenly change the way that the sensor sees or records light (there are no colour or exposure shifts, although there is an increase in 'hot pixels' and some digital noise). When digital first became mainstream most high-end cameras also had a base ISO (their lowest ISO) of 200 ISO. This equates to a good 2 stops faster than the popular fine grained Fuji Velvia. Photographers used to shooting Velvia were now getting getting shutter speeds an order of 4 times faster than they were used to - a big difference if you are trying to blur movement. 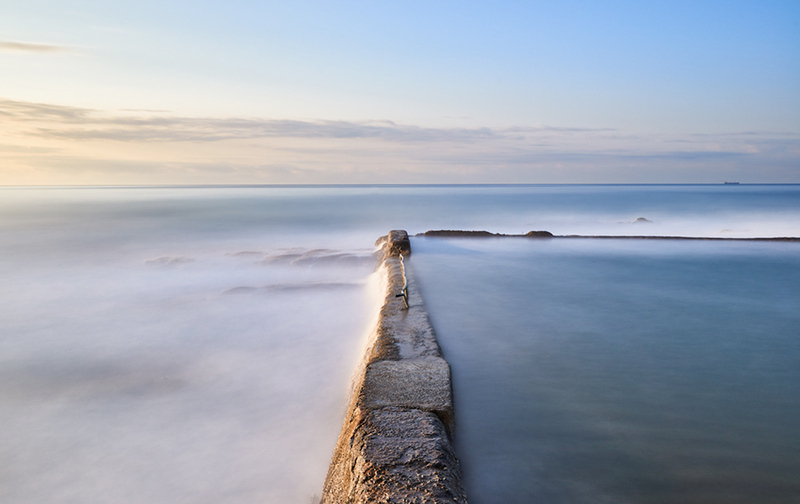 I believe it was Lee filters that first brought out a filter they dubbed ‘The Big Stopper’, which reduced the amount of light reaching the sensor by 10 stops (an original exposure duration of 1/15th of a second becomes 1 full minute). Since then they have also introduced a ‘Super Stopper’ which reduces the amount of light by 15 stops, and have also been copied by several other filter manufacturers. Neutral density filters come in a range of light reducing options for both square filter systems as well as round threaded screw-on filters. There are also the variable neutral density filters which are designed for video work, but can still be used for stills photography (with some serious caveats). The basic premise is that the ND filter simply reduces the amount of light passing through to the sensor. However, because of the effective density of the glass, odd things can happen to the wavelengths of light as the filters become darker. At least until now, cooler colour casts were the norm for filters that reduced light beyond 2 stops (the red and orange wavelengths of light were effectively blocked by the ND filters). An old Minolta 52mm thread 2 stop ND of mine actually has a warm colour to it to try and negate the cooler cast that often resulted from NDs. Newer filters produced by Lee, Nisi and Sirui have managed to get around the colour cast issue for the most part. Apart from a change in the colour cast on some filters, an issue that photographers first encounter with ND filters is reflections between the filter and the front of the lens. This is particularly the case with filters that reduce the amount of light by more than 4 stops. To minimize this risk both Lee and Nisi add a light baffle to the edge of the glass filter. This is made of a dark foam and presses against the filter holder itself. Sirui and Venus Optics add the light baffle to the holder itself. Obviously, threaded screw in filters don’t have this problem as there is no open gap between the filter and the front of the lens (any gap that exists is enclosed by the metal of the filter frame and thread). In the image on the right the result of light entering from the side on a ND filter without light baffle can be seen (in this case my old Lee 6 stop where I have actually peeled the foam off). The light has hit any scratches and dust on the filter and the GND (the scratch is on the 0.6 Hard GND) and highlighted these. The image is unusable as a result. The second issue is that long exposures often end up with a strange ghosting on the image itself. This is caused by light leaking through the viewfinder and into the mirror-box of the camera. The only way to counteract this ghosting is to close the viewfinder either with an (usually) included viewfinder cap, or on some high end cameras, the viewfinder curtain. Either way, the only way to stop the ghosting is to block light from entering the viewfinder of a DSLR. Mirrorless cameras don’t have this issue as there is no light that can reach the sensor apart from that coming through the lens. 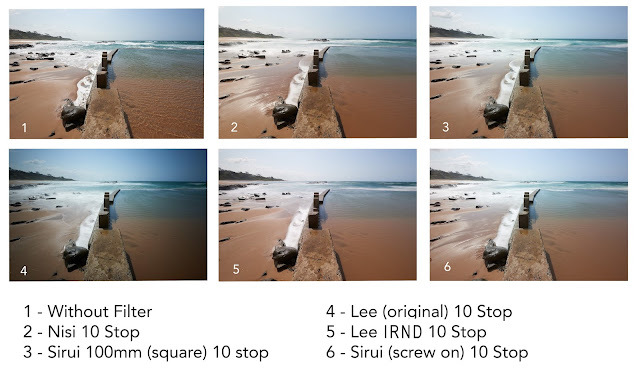 Lee are the much copied original creators of the 10-Stop ND filter. As such the original ‘Big Stopper’ does show it’s age somewhat. The filter has been criticized by photographers for its strong vignetting effect - most evident on ultra-wide angle lenses - and obvious blue colour cast. For this reason Lee updated their pro glass filters this year with what they call IRND filters. The filters are made from 2mm optical flat glass. In theory they have been designed to block ultraviolet and infrared light pollution, resulting in a crisper image with neutral colour cast. The new ProGlass IRND filters come in 2 (0,6ND), 3 (0,9ND), 4 (1,2ND), 6 (1,8ND), 10 (3ND) and 15 (4,5ND) stop variants. From 6 stops onwards, the filters have a thick foam rubber light gasket to minimize internal reflections. the original filters were packaged in black tins lined with soft foam. I ended up losing the thin strip of surrounding foam from all of the tins that I have had over the years as they would simply blow away if you tried opening the tin in the wind. The new IRND filters come in a stiff leatherette pouch with an elastic strap and magnetic seal at the opening to stop the filters from inadvertently falling out (I prefer this latter solution personally, although now principally use the Lee field pouch to store and access my filters). The filters feel pretty tough, and at 2mm thick are the industry standard. They even have a slight bevel to the edge of the glass so mitigate against the edge chipping. However, it doesn’t take a lot to smash one of these filters. I have personally destroyed one Big Stopper by accidentally dropping the holder while shooting in Namibia, and have seen two others smashed on rocks and one where somebody accidentally sat on it ending with the same result. Consider these expensive pieces of glass as extremely fragile. The good news though is that they do not scratch easily which is something that happens regularly to resin filters (such as Formatt’s regular ND filters and Lee’s resin ND graduated filters). Something to remember is that Lee have been making and refining their filters for quite some time now. My ‘Little Stopper’ (6-stop ND) is the oldest of my filters. It exhibits the tell-tale blue cast that Lee’s older filters have been criticized for. Unlike the newer filters, and indeed even the original 10-stop ND of mine that I have only had for one year, there is no bevel to the edge of the glass (making it more prone to chips and breakage) and is marginally thinner (the actual weight of the filter is 5g lighter than the newer filters). This means that if you are using a filter that is 10 years old, Lee have updated and improved even their original optical designs and coatings. Nisi have recently emerged as a viable competitor to Lee filters (at least here in South Africa and in Europe - Americans can also consider Singh-Ray and Breaththrough filters). The quality of the Nisi filters as a whole is excellent and stands in direct competition to the costly Lee filters. Like the Lee glass filters, the Nisi filters also have a beveled edge, but one which is not quite as deep. It has the same effect of mitigating against chipped edges and also allows the filter to slide into the holder more easily. What I really liked were the rounded corners on the filters, again assisting with sliding the filters into place, and probably also protecting the filter from hitting a 90 degree corner and shattering. Also like the Lee Big Stopper the Nisi ND filters all have a foam baffle to to stop light from entering at the rear of the filter. They have a slightly different design to the Lee. Where Lee uses a simple cutout square frame of foam, Nisi uses a rounded corner cutout that allows for a slightly wider long edge. In practice it means that there is slightly less chance of vignetting caused by the actual baffle. Bear in mind that neither filter vignettes on a 16-35mm f4 Nikkor lens, but on my Laowa 12mm both vignette, with the Lee vignette being significantly stronger than that of the Nisi. 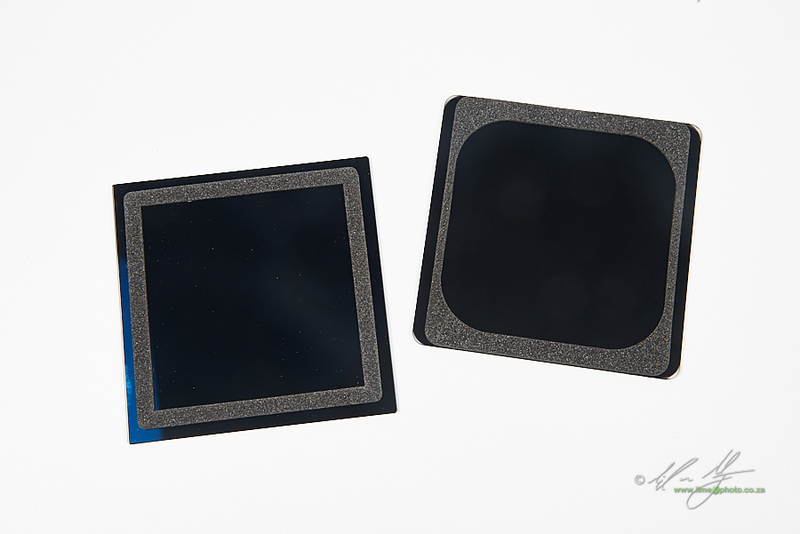 Known for their high-quality and relatively affordable stabilizing equipment, Sirui have recently entered the optics market with high end glass filters and lens accessories for cell phones. The filter system revolves around a 100mm square filter system which takes glass filters, while also allowing for the inclusion and rotation of a slim circular polarizer. Unlike the Nisi and Lee filters the Sirui ND glass does not have a foam baffle to block side entering light. Sirui have opted to rather add the baffle to the holder itself. This has an advantage in that it means all graduated ND filters are also baffled on the Sirui system, but has the disadvantage that the Sirui glass has the potential to have internal reflections and light leaks when used on other holder systems. Then again, the removal of the baffle makes the Sirui NDs more usable on some of the ultra wide lenses on the market as there is no potential for the foam to vignette. In use on my Laowa 12mm ultrawide, the Sirui was the only filter that didn’t vignette as there was no baffle to vignette with. The Sirui filters have the finest bevel of all three of the filter systems that I tested (excepting my old original Lee 6 stop ND). Oddly, the 10 stop filter I tested had no bevel whatsoever while the 3, 4, and 6-stop and graduated neutral densities all did. I think the glass also has a special coating that gives it a more reflective appearance than the other glass filters that I used (I’ll have more to say on this coating in the next section on graduated neutral densities). At any rate in testing the Sirui filters had uniform light dispersion (no vignetting), and good contrast. The Sirui filters all came in individual padded velvet pouches. These are some of the nicest pouches I have used. The Lee individual pouches are simply too bulky and weirdly have a habit of snagging the edge of the filter as you remove it. The Sirui pouches are slim, offer decent protection, are easy to use and fit into a camera bag far more easily than the Lee's. If I have a criticism it is that the filter fits exactly into the pouch, meaning that you end up getting finger marks on the edge while retrieving it (if the filter poked out a little on lifting the flap you would be able to grasp the edges of the glass and not the actual flat section of the glass). One of the biggest things to come to grips with is the apparent change in colour that you are likely to experience with any ND filter that you use. In an effort to see the changes I did several comparison shoots between the filters. Above is a set of images of an X-rite colour checker passport. These were shot under studio lighting (Elinchrom BRXi’s) so that I could actually control the light itself. The unfiltered image was used to set the white balance in post (Adobe ACR 9.12) and was then applied across the other images so as to see the change in colour caused by the filters (in theory if you click on the images a larger version will appear). The second set of images above were shot during the midday when the light was as close to what one would term ‘photographic daylight’. The images were shot in a sequence such that there was no change caused by overhead clouds - all the images were shot in full daylight. This last set of images (actually the first that I shot) were created just after sunrise when the light was relatively warm in terms of its Kelvin temperature. The first set of images is probably the most informative of these sets. 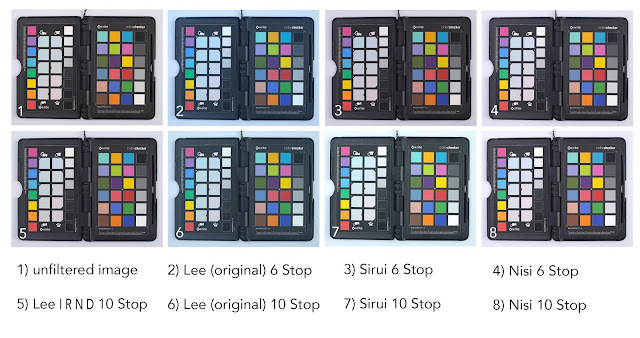 From this it becomes apparent that the Lee IRND and Nisi 10-stop and the Nisi and Sirui 6-stop filters are the most colour neutral of the filters tested. The original Lee 10 and 6-stop filters both exhibit a strong blue cast, as well as a reduction in contrast. The Nisi filters appear to have an edge in both the 10 and 6-stop filters when it comes to perceptual contrast. The second and third sets of images are where it starts to get interesting. In the second series it is hard to tell whether the Sirui 10-stop has a colour cast at all, yet in the studio image there is a fairly obvious blue cast. The answer lies in the third set of images. The Sirui filter seems to be blocking the slower wavelengths of light - the reds and oranges. This is more obvious when the actual ambient light temperature is in the lower Kelvin temperatures (i.e. warm) as it would be when the sun is low on the horizon. When the light temperature is closer to ‘photographic daylight’, as when the sun is at its zenith, the colour cast is far less apparent. I also tested the actual light transmittance of the 10-stop filters. I set up a studio light and set it to modeling mode with a snoot attached. Placing a Sekonic L-358 light meter in the snoot in reflectance setting I was able to get a reading of 11 Ev. The Sirui blocked the least light giving a reading of 1,2 Ev. The Nisi gave a reading of 1,1, the original Lee an exact 10 stops loss at a reading of 1,0 and the new Lee IRND filter blocked just over 10 stops of light giving a reading of 0,7 Ev. this means that there is going to be minor differences in exposure and perceptual contrast based on the filter you choose. At this point it is worthwhile pointing out that sample variance can rear it's ugly head here. It is entirely possible that another photographer with a similar filters could get different results. As much as the manufacturers claim that there is an exacting quality control process, the manufactuer of filters is not quite the same as actual photographic lenses. Coatings can differ slightly over time. Coatings also age over time. Lee resin filters used to have a habit of developing a slight green cast. Cokin filters on the other hand tended towards a magenta to purple colour cast. On replacing a Lee 0,6 Hard GND I discovered that the replacement had a green cast to the ND section while my sadly scratched original was closer to neutral. On top of sample variance is personal taste. 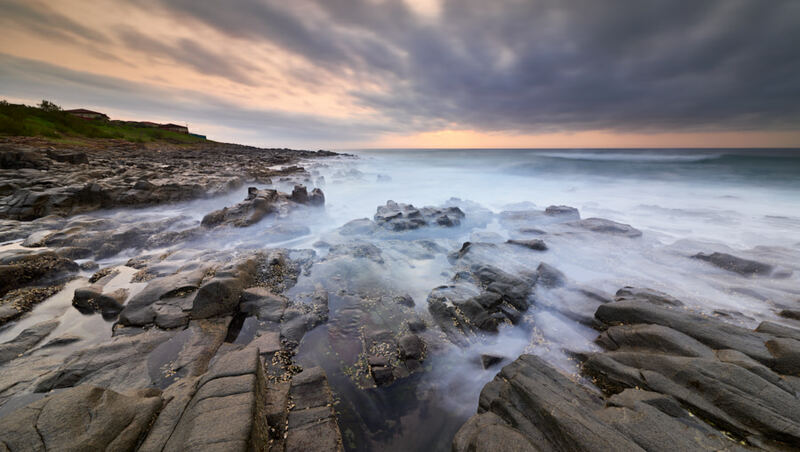 A lot of photographers have grown to appreciate the particular look that comes from the original Lee Big Stopper. When I posted the above comparisons on social media during the testing, a few photographers expressed that they preferred the look of the images shot with the original Lee filter. During the testing I was frequently asked by photographers which neutral density filter I thought was the best. The answer isn’t as clear cut as it should be. Several factors come into play. These being: price, colour cast, your existing system (if you have one) and whether you want the light baffle or not. The clear winner here is Sirui. If budget is the primary consideration Sirui offers excellent value for money. On top of this Sirui South Africa will be running a promotion starting on the 20th September with discounts on their filters and holder system. After Sirui the original Lee ‘Big Stopper’ is the next option. However, it has come down in price since the introduction of the IRND glass (which is also the most expensive option). The in-between is Nisi. If you are looking for more than just the single filter, it gets a little more complicated. Nisi offers several packages that are keenly priced. The package that I was sent to test is the Nisi 'Advance Kit', consisting of 3, 6 and 10-stop solid ND filters, a 3-stop soft GND along with a 3-stop reverse GND, the V5 PRO holder with 67, 72 and 77mm adapter rings (the native size for the holder adapter is 82mm), an 86mm Pro Circular Polariser, air blower, lens wipe, and glass 'cleaning eraser' which was all packaged in a sturdy carry-case (see above). This full set costs R12,995 from Landscapegear.co.za while the equivalent Lee setup would come to R19,945! Sirui is similarly better priced (particularly with the upcoming special run by Sirui South Africa). Whether you already have a system clearly is a factor in deciding which filter to buy as the actual kits are significantly better priced than buying individual components. As has become clear through the images above, colour cast can be an issue with some of the images. The Nisi and Lee IRND filters tended to be the most colour neutral along with the Sirui 6 stop. However, fixing colour cast in an image is not difficult at all. As can be seen in this image below, a simple change to the white balance slider can get the Sirui 10 Stop back to looking like it is as neutral as the other more expensive filters. Personally, I find little difference between the Nisi and Lee IRND 10-stop filters and would be happy with either. I own both the Lee original and IRND 10 stop filters. There is no reason to replace the IRND, but if I had to I would be more than happy doing it with the cheaper Nisi equivalent. When it comes to the 6-stop filters all three manufacturers produce excellent options. Whether you have an existing system is likely one of the biggest deciding factors when choosing one of these ND filters. As pointed out above, Nisi have extremely competitively priced starter, advanced and professional kits. Likewise by combining various kits from Sirui you can get a fairly comprehensive system for significantly less than the Lee offerings. The good news is that all of the 100x100mm filters are compatible with any of the holders available (see the previous article on the 100mm holder systems). In fact in some cases they are more compatible than expected; such as the fact that the Nisi simple V2 holder accepts the Lee 105mm circular filter adapter. My initial concern about the Sirui filters being potentially thinner than the other manufacturers was put to rest when I used a caliper to measure all the filters. In the end the thinnest filter was actually my old Lee ‘Little Stopper’. However, as I will point out in the next essay on graduated neutral density filters, the larger Sirui glass GND filters slowly slide or slip out of the Lee holders. This one example means that if you opt for Sirui GNDs, you need to use either the Sirui or the Nisi holders. The solid ND filters don’t exhibit this issue however. Users of the Lee system do need to be aware of using glass graduated filters (GNDs). As I'll discuss in the next essay, I found that the Sirui glass GNDs do slide out of the Lee holder due to their weight and the optical coating that makes them quite slippery (they are held perfectly in place by the Nisi and Sirui holders). 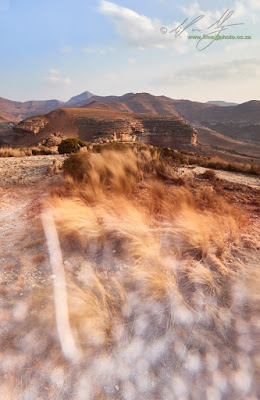 Although I didn't have the same issue with the Nisi filters, Hougaard Malan from landscapegear.co.za pointed out that he has. It may be that we have different aged Lee holders, of which mine might actually have stiffer tension springs. Regardless, if you are using a Lee holder be aware that some photographers have found that the Nisi glass filters, like the Sirui filters, gradually slide down out of the holder (this is particularly the case for the slot furthest from the front element of the lens). I'll look at this in more detail in the next article dedicated to graduated ND filters. Of course if you opt not to use a system at all, then there are several other circular neutral density options to choose from. I have had the opportunity to use some of the Sirui filters, but Nisi also manufactures conventional screw on NDs as well as variable neutral densities. Which brings me to the use of the light baffle on some of the filters. For most long exposure photography the light baffle is essential. Any stray light entering from the side of the filter is going to create issues with flaring and ghosting in the final image (as with the image below). Now, Sirui and Laowa have opted to place the baffle on the lens, while Nisi and Lee have placed the baffle on the filter itself. This obviously affects how the manufacturers finish their filters, with Sirui forgoing the baffle and Nisi and Lee adding it. Frankly - if the filter has to have a baffle - I prefer the Nisi as it actually avoids vignetting on some ultra wide lenses. However, if you want to take advantage of some specialist lenses such as the Laowa 12mm ultrawide, then the Sirui is the best option as it doesn’t have a baffle. As a South African photographer choice in equipment used to be severely limited. It still isn't cheap, but the options available to us for filter equipment have increased magnificently. On top of the three brands that I consider here, there is still the option to use Cokin/Formatt and the cheaper Chinese generics (although the quality can be iffy to say the least). You can also resort to eBay if necessary and order directly from the United States, opening up the option to invest in Tiffen, Singh-Ray or Breakthrough, but this is complicated and unnecessarily expensive usually. Ultimately I would be content with a mix and match system from any of the Lee, Nisi and Sirui options available. In terms of the 10-stop filters that I concentrate on in this article, the Nisi 10-stop probably represents the best all-round value for money and feature set. Below 10 stops and the field opens again and you could comfortably use the cheaper Sirui 6-stop filter (bearing in mind that one has to be careful using it without the light baffle). In terms of absolute image quality it is possible that the Lee IRND is in the lead, but it is extremely hard to judge this. Dark frame substraction is a way to remove hot pixels from a long exposure image. A black or dark frame can be created after the long exposure image, and then used to map out hot pixels in Photoshop. This means that it is possible to check the image before starting the black frame exposure (otherwise the photographer will only know whether the image has exposed correctly after the camera's long exposure noise reduction has finished. This can be a problem if the initial exposure was 30 minutes or longer). In this sequence one would first shoot the long exposure image, check the histogram and LCD. Then, once the photographer is satisfied, the black frame can be exposed. Leaving the camera in roughly the same ambient conditions (I often bring my bag with me so it cools down outside and put the camera in the bag while shooting the black frame exposure) trip the shutter for the same duration as the exposure, but this time with a lens cap on the camera (for safety sake you can even drop the aperture to its minimum value and close the viewfinder eye-piece). So, if your long exposure image had an exposure of 2 minutes, replace the lens cap, close the eyepiece and take another photograph of the lenscap for 2 minutes. Later, In Photoshop layer the second image over the long exposure image and set the blend mode to ‘Subtract’ (in earlier versions of Photoshop than CS6, set the blend mode to ‘Difference’). This literally subtracts the hot pixels captured on the dark frame from the original capture. It does a reasonable, but not perfect, job of removing the amp noise as well.